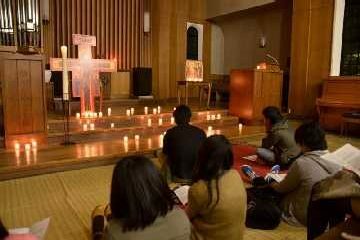 In many parts of Japan, people gather regularly to pray with the songs of Taizé. These prayers are also the places where the young people who have visited Taizé and the ones planning to visit Taizé could meet. The following is the list of some of these prayers. There are other meetings which are not in the list. Further information could be obtained from Taizé. You could find the dates and places of all the meetings in Japan at the following site as well. Monthly prayer meeting is held at Hakkakudo, an Anglican chapel of the diocesan office. Caritas Yonekawa Base, the base supporting the victims of Great East Japan Earthquake in Minami-Sanriku area, holds the regular morning prayer with the songs of Taizé. Every two to three month, a prayer meeting takes place at one of Catholic, Protestant and Anglican churches in Sendai. Nearly twenty parishes and religious communities hold the regular prayers. The followings are the prayers at Yotsuya. The details of all other prayers at various parishes and religious communities in Tokyo area could be found at the following website. An Anglican church holds the regular prayers. The regular prayers take place at one of Catholic, Anglican and Lutheran churches. Contact: Preparation team for the meditation and prayer in Kyoto. The regular prayers take place at one of Catholic and the United Chruch of Christ in Japan. The regular prayers take place at one of Catholic, Lutheran and Anglican churches.